Buying a camera for your kids can be a bit of a tricky task. There are so many colorful and cool looking cameras out there, and each one is claiming that their model is the best for your 3 year old. It gets even more confusing if you don’t know much about the technical language of digital cameras. So if you don’t know your megapixels for your viewfinders, don’t worry, because starwalkkids is here with our review of the best cameras for 3 to 6 year olds. While only a few years ago photography was an area only for professionals and serious hobbyists, these days you’ll find that many 4 year olds are the family photographer, as a range of quality and easy to use kids cameras have made this a great hobby for children. Size The first thing you should be looking at is size, you want to find something small and light that will sit will in your child’s little hands. It should also be easy for them to hold. However, its not just the size of the camera as a whole. Any buttons or knobs should be big and clearly marked out. We don’t want your young child getting frustrated with fiddly little switches that can spoil the fun, especially if you are looking for a preschool camera. Durability As with any type of electronic for children, kids are kids, and they’re probably going to drop it at some point. Therefore, you must find something that is durable enough to take a few knocks and not break down. Features A good camera for a 4 year old should let them do more than just take pictures. 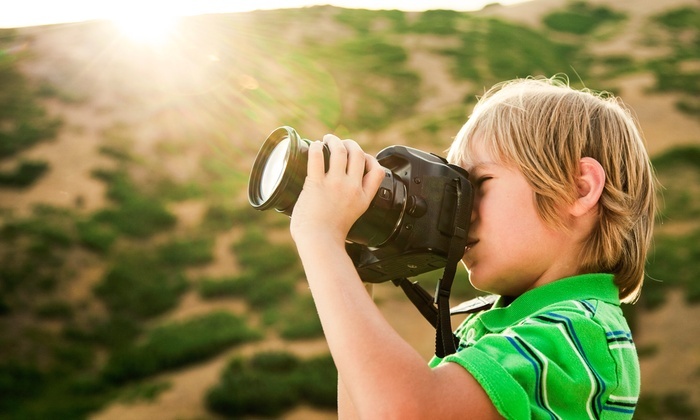 The best have all kinds of neat features to help stimulate your child and teach them about photography, including easy to use editing activities such as adding cartoon backgrounds or animals to their photos. Some might have built in games, while others might even let them animate their photos. So before you buy one, make sure it has some fun features for them. Easy to use The last thing you want when buying a cam for a young child is for them to be confused and bogged down by a bunch of complicated settings. A good kids digi cam would have very simple and intuitive settings that are easy for them to use. Once they get older, they can always get a more complicated camera, but giving them something hard to use at this young age will do nothing but turn them off photography. Batteries needed a good camera suitable for 5 year old should have a built in battery and charger, but it is always worth checking just before you hit that play button. Running a camera that takes rechargeable batteries isn’t that big of a deal, but its better to know that before you buy rather than it be a surprise. Connecting to a pc or mac You get the most out of a digital camera when your kids can connect it to a computer an upload their photos, not only to digitally store them. While any modern camera should be compatible with PC or Mac, its best to check before you buy. Also, it is worth checking to see whether or not it comes with the cables you will need. 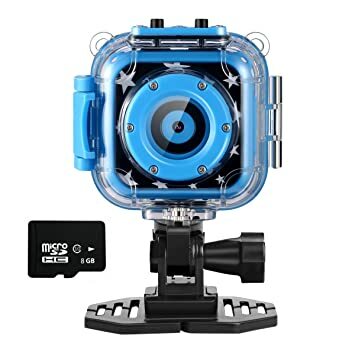 If you’re looking for a great action cam for outdoor kids, this wonderful waterproof machine will make a great gift if you want to find a camera for 6 year olds. 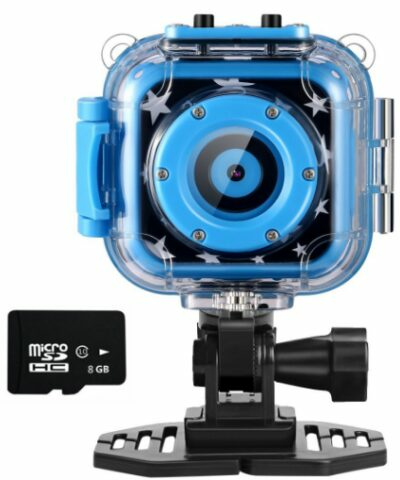 Made with environmentally friends materials and durable enough to withstand drops, this action cam is just perfect for kids who like motorcross, bmx, skateboards and other outdoor activities. Plus, as it has a waterproof case, it can survive both the weather and any crazy underwater activities your little rascal might be up to. It also comes with a whole bunch of accessories, so it is ready for action right out of the box. Finally, it comes in both blue and pink, making it a great camera for girls and boys. One of your main concerns in buying a camera for a 3 year old is going to be durability. After all, no matter how careful your child is, they’re probably going to drop it at some point. That’s were the Fisher Price tough cam comes in. These things have been specially built to survive all the bumps, drops and scrapes a child friendly camera needs to withstand. Your child can also add cool effects and edits to their photos by using the free downloadable software available for this cam. 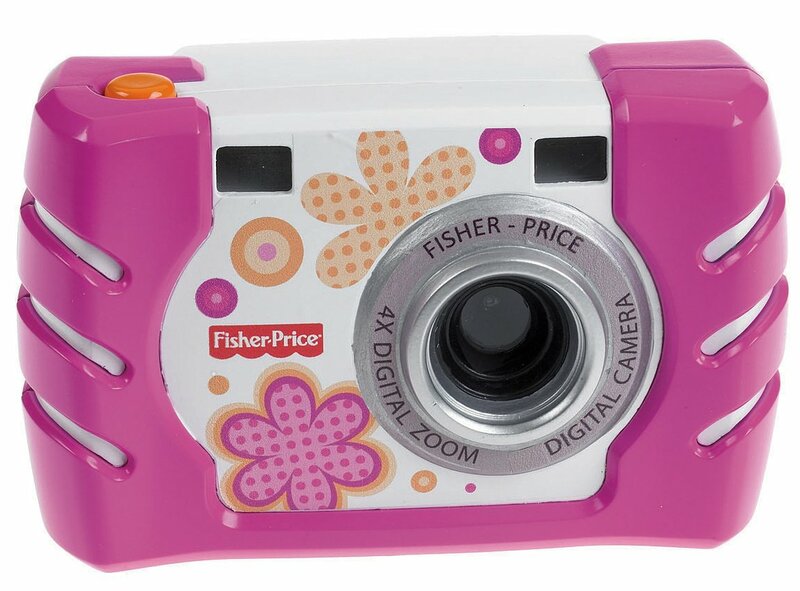 Also, if you want a digital camera for a girl, this comes in many different colors, including a stylish pink. This camera is a good pick for a 5 yr old and is a very child friendly camera, ideal is for an aspiring film maker. Your child will just love this cool kids digital video camera, and they’ll have all sorts of fun making their own short movies, filming documentaries of the family and capturing their own wildlife videos of the animals in the garden. Its not just videos though. This also takes great photos, and it has a cool photo frame editor that can add silly frames to the photos your kid takes.. 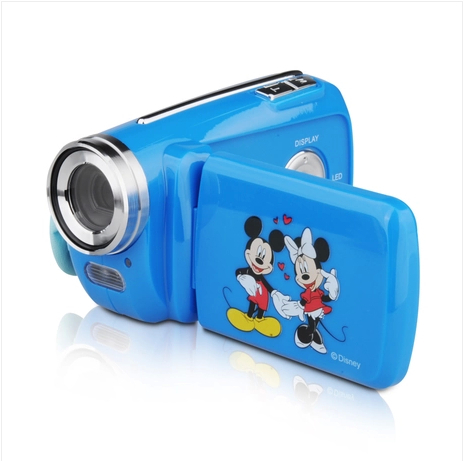 This camera has a special ergonomic design to make it easy for kids to carry and use. It also has some cool features, like automatic shut off to preserve battery life and replaceable batteries. If your child wants to become a great film maker, or they just want to make some funny videos for Youtube, this PowPro will make a great video camera for a 6 year old too. Made with big chunky grips and large child friendly buttons, this cool digi cam doubles up as a projector with the flip of a switch so your child can show off the great photos they’ve been taking. They can also add fun stamps, frames, animations and sound effects to their pics on the camera itself, no need to use other software. So your little boy or girl will really have a blast taking pictures and adding some crazy effects to them. With so many features and easy ways for your child to edit their pictures, plus the fact that they can project their photos for the whole family to see, this is one of the best cameras for 6 year old. 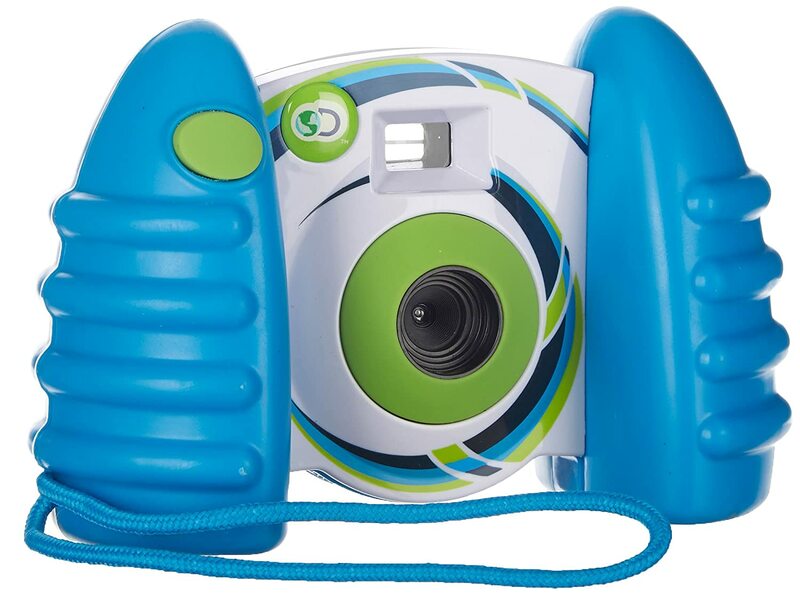 This retro looking cam is sure to be a favorite for your 4 year old! It has a colorful and child friendly design, and the manufacturers have made this very small and light so your young ones will be able to carry it easily. It takes 5 mp pictures, and also has a whopping 1GB memory card which can store hundreds of your little photographers pictures. It is a bit light on features, so it is probably best for a younger child or toddler. This is definitely one of the best cameras for 3 year old. Does your child like the thrill of riding a BMX or skateboard? Do they like skiing, surfing or snow boarding? Then an action camera for kids is exactly what they need. These cool cams come with 2 different mounts so they can be attached to your child’s vehicle of choice, just like a go pro, and they can then record all kids of crazy action packed videos as they ride, slide and jump. In order to survive all this action and not get busted up, you’ll be happy to know that these action cameras are very stable and durable. Better still, they come with waterproof casing, not only making them weather proof but also able to make some crazy underwater videos. For life on the wild side, this might be the best digital camera for 6 year old who loves adventures and riding. I think this an ideal camera for four year old, thought I’d seen everything you could make with Lego blocks, until we found this nifty digital camera little kids. This cute Lego cam is a little short on features, and it doesn’t come with any editing software, unfortunately, As its one of the more simple cameras on our list, we recommend it as a camera for three year old who can’t get enough Lego in their life. Action Cameras make brilliant gifts for children, and the Dragon Touch is one of the best we’ve ever seen. With cool camera modes such as burst and loop, little film makers will have amazing fun with this splash proof video camera. It is also packed with a number of different mounts and stands, meaning that your child will have no problem finding the correct stand for their favorite mode of transport. This is a really well made and almost professional level camera. It doesn’t have any games or anything like that, so we only recommend this for older children. Kids just love exploring and discovering the world around them, so why not let them capture their adventures on this cool Discovery Digital Camera. This great digi cam has been specially designed to withstand all the punishment a 3 year old might throw at it, and you can easily hook it up to a computer in order to download and back up your kids photos and videos. With cables and software included, this great little cam has everything you need in the box, aside from batteries. Due to its sturdy and durable build, this is a great for digital camera for 3 year olds, as you won’t have to worry about them breaking it. If you are looking to buy a digital camera for a 3 to 6 year old and you don’t mind splashing out a little, the Ourlife Action Cam is going to make a certain little photographer very happy. For starters, this thing is very durable, so it can withstand those bumps, knocks and drops that will inevitably come with kids using a camera, and with its waterproof case, you can be sure that it’ll last through whatever antics they get up to with it. they really can take this almost anywhere with them and get some great pictures or videos. This might be an ideal camera for six year old, which comes with a number of different straps and mounts, so it is perfect for riding, boarding or climbing. Even if your child isn’t into bicycles and skateboards, the sheer versatility of this great action camera means that it’ll be really adaptable to whatever hobbies they pick up. Weather its going climbing, hiking, swimming, biking, making movies with their toys, strapping the camera to their RC cars or simply taking the family group photo at Christmas, this action cam is going to be a quality and enjoyable gift that your child keeps going back to. Digi Cams These are pretty much the standard when it comes to getting a cam for a kid. They look just like the kind of camera and adult would use, only a little bit more colorful and a lot cooler. Digital Action Cameras Made for adventurous kids to take on their wild adventures, action cams usually come with waterproof covers and stands or mounts so they can be attached to a bicycle or skateboard. The kids can then take crazy shots or videos of their rides, or take the cameras underwater and make all kinds of cool videos and photos. 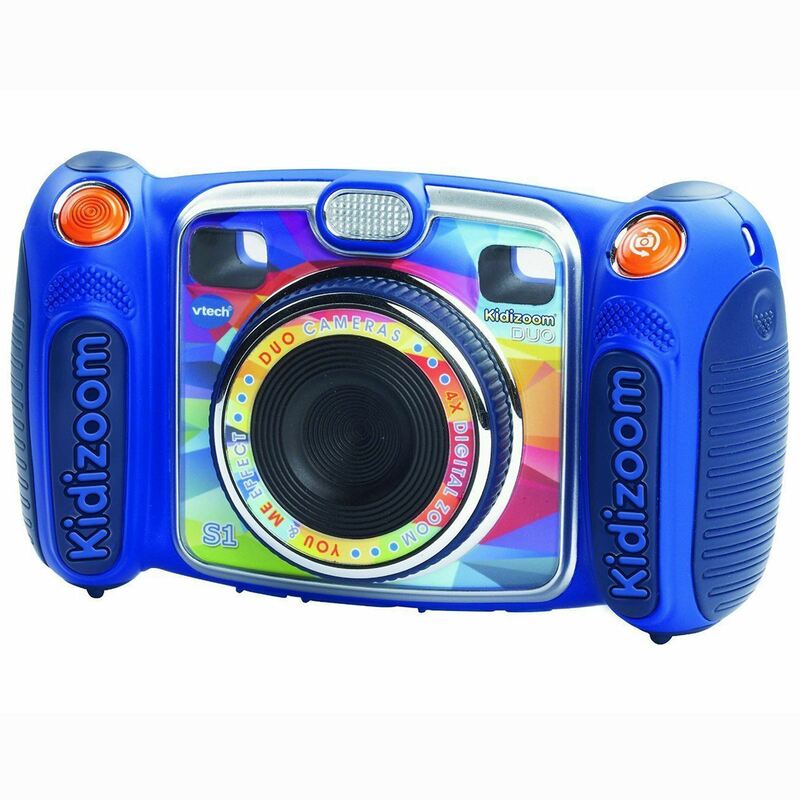 VTech Vtech has really taken the market by storm with their Kidizoom camera series. This range is known for making high quality cameras with lots of child friendly features, such as simple controls, easy to use editors and waterproof covers. Drograce Although some people see this company as a Vtech copy cat, and they do have some very similar designs, we can’t deny the quality and reliability of these great kids digital cameras. Drograce specialize in making cool action cams for kids who like to live on the wild side. Fisher Price The kid tough digital camera range from Fisher Price are brilliant cameras for 3 to 6 years olds, as they are made just like their name suggests. tough enough to withstand kids. These digi cams have lots of features and are compatible with both windows and mac. Playskool Playskool have been making some really brilliant digital cams for kids for a number of years now. 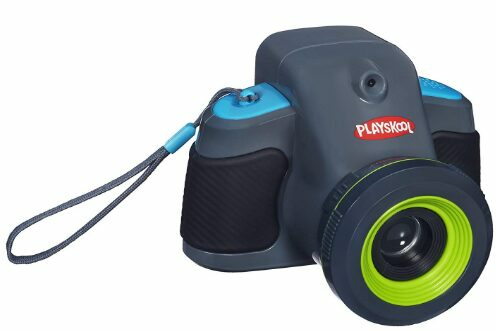 WE really like their Playskool Showcam range, which are designed with big and simple controls so that younger kids will have no trouble using them. What we really love about these is that they have all their editing programs built into the camera, so there’s no need to connect to a PC or Mac. PowPro Powpro make some brilliant preschool camera and models suitable for older children. These cameras are very light and easy for little hands to carry, and we reallyu love their functional and retro designs and colors.